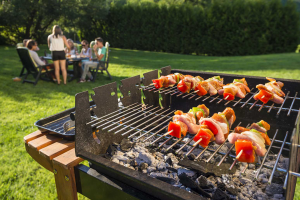 Most buyers don’t need a gas grill and a charcoal grill, because they don’t tend to entertain huge numbers of friends regularly, so that kind of space is not required. Even among buyers who do need lots of space, there’s usually a preference for one or the other. So, these combo grills have to be so good, that they appeal to those buyers who need space, and at the same time, pull in other buyers who previously wouldn’t have considered a combo before. When they work, they work exceptionally well, because you get a kitchen on wheels, for outdoor cooking; but they don’t always work out. I’m going to be concentrating on one particular grill, the Char-Broil Gas and Charcoal Combo Grill, Standard Model, and I’ll be replacing the jargon, with facts, so you’ll find out how it really cooks meats. At 140 pounds, the Char-Broil is standard weight, for a combo grill, so while there’s nothing special here, it’s certainly not among the heavier grills on the market, and with the wheels, you’ll have no problem shifting it into position. You have two grills side by side, with the gas grill on the left, the charcoal grill on the right, and they’ve then been placed upon a cart that has shelves built underneath for extra storage. It’s all pretty well designed, and looks a well-thought-out durable model, with an easy access door for adding charcoal if and when needed. As far as assembly goes, this is one of the easiest out there, excluding super-portables, and you’ll be done within 30 minutes. It’s been designed for simplicity, and functionality, so this will relieve many previous buyers of combo grills, who are used to being prepared for extended assembly time. On the gas grill side, you’ve got 3 main burners, with a 36,000 BTU heat output per hour, which with cast-iron cooking grates, means the gas chamber is incredibly good. You’re going to get quick grill times, combined with evenly cooked food that doesn’t stick, and meats will retain their natural moisture barrier, for succulent, juicy tastes. 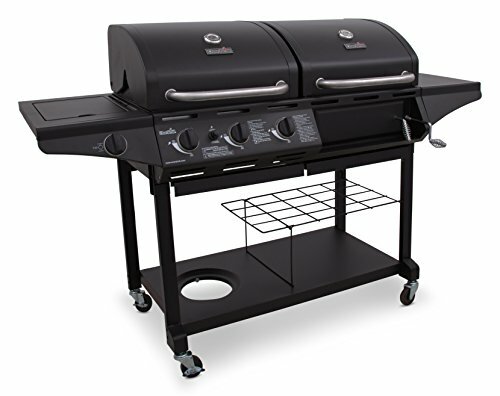 The side burner is not bad either, at 12,000 BTU’s an hour, so you’ll be able to do more than heat up sauces on this, At less than $400, it’s the same price as many single-use gas grills, so the quality makes the Char-Broil a very affordable grill. The first problems come on the charcoal side, and this is unusual because charcoal cooking is what these combo’s do best. The grates are steel, compared the cast-iron on the gas grill side, and as such, they don’t disperse heat as well. They’re actually rather bad because they’re quite a thin steel, so while food won’t stick, it will take a lot of concentration to make sure food is evenly cooked. The temperature control also comes into play more in charcoal cooking, and in the absence of good dampers and vents, the Char-Broil has adjustable grate heights. This is simply not good enough to give buyers a huge amount of individual control over heat. While the charcoal grill will cook great food, don’t expect any kind of experimentation, with different styles of grilling. The cleaning is easy, with porcelain coated grates, for one wipe cleanliness, and the ignition is fast too, so there is general ease of operation here, especially with the thermometers placed so that you can clearly see and read them. There is also an easily accessible trap door for charcoal, so putting more in also won’t be a problem, and it doesn’t let much hot-air out, so as such, doesn’t slow down the grilling of food. At under $400, it’s probably worth buying this as a gas grill only, so for gas grill buyers, it comes strongly recommended. Despite the problems with the charcoal grill, it will still cook great food, and you can use it as a side unit for extra food you can’t fit on the gas grill. The weight is good, and the Char-Broil also offers a total of 505 square inches of cooking space, so you won’t run out of room. The overall design is durable, and the assembly is quick. The verdict: This might be the best gas side of all the mid-priced combo’s available, and while it’s slightly let down by the charcoal side, it’s definitely worth spending money on.